We are carrying out essential resurfacing work on a westbound section of the A4174 ring road between the Hambrook traffic lights and the Wick Wick roundabout from Friday 7 to Monday 10 October. This will involve the full closure of the westbound carriageway of the A4174 between the Hambrook traffic lights/Bristol Road junction and the Wick Wick roundabout from 8pm on Friday 7 October to 6am on Monday 10 October. This work is part of the Challenge Fund project, and will involve removing the existing road surface and laying a new one. 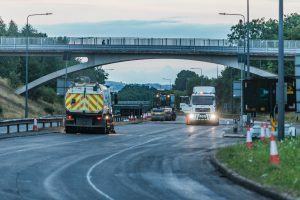 In order to carry out this work as efficiently as possible and to minimise disruption to local residents and businesses, we need to make a full closure of the westbound carriageway. South Gloucestershire Council’s Head of Street Care and Transport Mark King said: “It’s important that we carry out this essential resurfacing work now, before the colder weather and the surface deteriorates any further.